The 2004 American Silver Eagle Coins returned decent improvements on both their bullion and proof mintages for the year. Likely fueling a large part of that improvement was significant growth in the silver market. The cost of an ounce of the precious metal had been slowly improving over the last couple of years after having bottomed out in 2001 at $4.37. However, 2004 saw the largest increases with an ounce of silver averaging $6.67 for the year. This was up $1.79 from 2003. Even more impressive was the precious metal’s December numbers where it actually went over $8.00 an ounce for a couple of those days. The US Mint recorded the 2004 Bullion Eagle mintage at 8,882,754. This was an improvement of 387,746 from the previous year, or 4.6%. Helped in part by an increased mintage cap of 850,000 on the strikes, the 2004 Proof Silver Eagles came in at 801,602. This was a jump of 53,771 from 2003. The Silver Eagles were available for nineteen years with the release of the 2004 strikes. 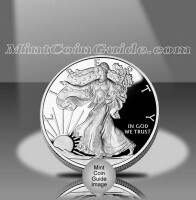 Proof Silver Eagles were released by the US Mint on April 27, 2004. Bullion Eagles were available for most of the year. Showing only their third increase since their debut, the US Mint raised the price of the Proof Silver Eagles to $27.95 per coin. Bullion Eagles were still available from the Mint’s network of authorized purchasers for a small premium above the spot price of the silver contained within them. Bullion and Proof Silver Eagles were struck at the US Mint’s facility in West Point. Bullion Eagles contained no mintmark while the proof versions had the appropriate ‘W’ mintmark. "Walking Liberty" is featured on the obverse (heads side) of the Silver Eagle and was designed by Adolph A. Weinman for the half dollar coin which appeared from 1916-1947. John Mercanti designed the heraldic eagle which is found on the reverse (tails side).